My name is prabal and I am again back with a awesome trick to create a folder in PC without Name. we will see how to create blank folder names in Windows. I have used this trick earlier on Windows Vista and Windows 7 – and it now also works on Windows 10 / 8.1 as well. I do not remember if it worked on Windows XP and earlier. Rename Existing folder or create a New folder on desktop or wherever you need. 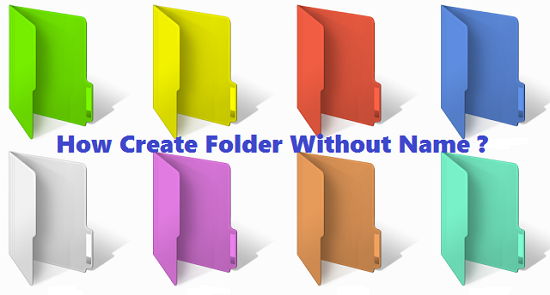 You need to be renaming folder so Right click on created folder and select Rename. Remove or erase existing folder name. If you are using laptop confirm that Num lock key is on, you need to enable your Num Lock. Now release alt key and Press enter key. Done!!! A folder with no name will be created easily. 1. Select file, press F2. 2. Hold alt key and type 0160 from the numpad. 3. Release the alt key. Now without doing anything else, again hold Alt key and press 0160. 4. Press enter and you will have second nameless file in the same directory. 5. Repeat step 3 to create as many nameless files or folders in the same directory.